Now I’ve used up half my blogging time not even talking about the Saturday puzzle. Highlights! We got ’em: MARTINI, ADULTING, BEER GOGGLES, ZOROASTRIAN, YOSEMITE, ZOOTOPIA, Pee-Wee Herman IN CHARACTER, GOING STEADY (though it’s a quaint term not in much use these days … and come to think of it, it may have been dated 30+ years ago, too), and SPLASHY. 22a. [Baby food], PAP. 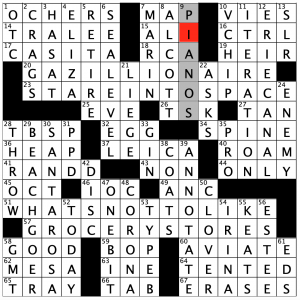 Still waiting for newspaper puzzles to stop being afraid to clue PAP via a routine medical test that about half of solvers will probably undergo dozens of times in their life. 24d. [Induces to commit a crime], SUBORNS. Can you suborn anything other than perjury? What are my options here? 4.2 stars from me for this 68-worder. DECK THE HALLS is the song of the day. If you haven’t already heard it enough by now over the airwaves, consider yourself earwormed — Christmas-style. 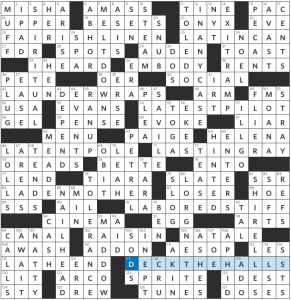 (The revealer clue at 117a is [Song whose refrain has been prefixed to nine answers in this puzzle.]) In other words, one FA and multiple LAs are prepended to common phrases. 25a [Unit of a VI-pack?] LATIN CAN. Tin can. 42a [Take care of dirty shawls and scarves?] LAUNDER WRAPS. Under wraps. 54a [Trial episode just received by a TV exec?] LATEST PILOT. Test pilot. This one works quite well. 66a [Lech Walesa, before he became active?] LATENT POLE. Tent pole. 71a [Beam of light that never dims?] LASTING RAY. Stingray. 84a [One carrying twin daughters?] LADEN MOTHER. Den Mother. 91a [Unconvincing-sounding cadaver?] LABORED STIFF. Bored stiff. I like this one as well. 115a [Turning tool’s tailstock?] LATHE END. The End. An appropriate finisher. 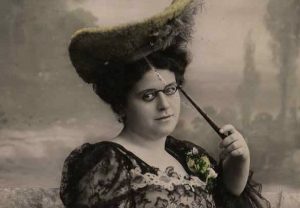 A woman using a LORGNETTE. Fancy! LORGNETTE [Specs with a handle]. New to me. PENSE [“Honi soit qui mal y ___“]. The clue helped not a bit (for me anyway); I needed every crossing. PETREL [Far-ranging seabird]. Don’t think I know this one; is it related to a kestrel? OREADS [Nymphs of the mountains] aren’t that uncommon in crosswords (but they should be), and I can never remember the spelling. Other ucky stuff includes ENTO, ERSE, IRT, SSR, SSS, SSTS. There are goodies of course: SHIRELLES, SPIRITUAL, MELTDOWNS, IN ANY CASE, EXIT RAMP, NAIL HEAD, TOLERANCE. That’s all from me. A solid Saturday to end the week. 3.5 stars. See you on Monday. This is another stellar C.C. Burnikel construction. Although there is not an entry longer than 11 letters, all six of them are intertwined in the middle of the grid. I will of course highlight a few of these phrases below, but this puzzle makes it look like it was easy. Some phrases are a little less than common, but all are easily solvable regardless. I have raced through some LAT Saturday puzzles in less than 6 minutes before, but this is still a quick time for me. It was also fun. A solid 4.5 stars today. 14A [Taiwanese drink originally made with milk and tapioca pearls] BOBA TEA – I have had this once or twice. It is different, that’s for sure, than what I grew up having. I haven’t seen this in a while, and I don’t even know where to get one. Perhaps an Asian restaurant? 16A [Series of celebratory visits] PUB CRAWL – I have never done this. And have no plans to. 34A [Response to a welcome return] WE MISSED YOU – Another great casual phrase. 39A [Avril follower] MAI – “MAI tai” is also a foreign term. How much French is reasonable to know? I took it in school, so any French is usually a gimme for me. Others may disagree. 50A [Factor in exit velocity, in baseball] BAT SPEED – It’s all in the wrist! Seriously, even the great Hank Aaron, especially when young, wasn’t all that big or bulky, but he had humongous forearms that generated tremendous bat speed. 3D [Checkout choice] PAPER BAG – Usually it is just “paper or plastic” that is asked; the bag part is understood. Still legit. I think more of [What a fan of a bad team has on his head]! 5D [ __ Fire: 230,000-acre Northern California conflagration of 2018] CARR – This was all over the news, but this is thousands of miles from me, and for perhaps that reason I couldn’t remember the name of it. 14D [Informal discussion] BULL SESSION – I usually hear another word in between these two! 16D [Side with a dog] POTATO SALAD – This, I suppose, is correct to some, but I have a gripe here. I couldn’t tell you the last time I had a hot dog and had potato salad with it. Is it just me? I see no correlation, other than both are traditional “picnic” or “barbecue” foods. Am I being to picky?? 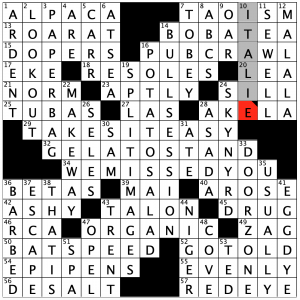 26D [Four-time Australian Open champ] SELES – The Aussie Open is arguably the lesser of the four majors in tennis, but it seems to appear more often than the others in crosswords. She won the French and U.S. Opens as well. 33D [Hazardous area for a bicyclist passing a parked car] DOOR ZONE – This seems contrived, but those bike paths slide right by car doors. Please be safe! Very nice! Enjoy your weekend, everyone! This one started off rough for me, then it seemed to fall easily. It turned into a true “Lester Ruff” puzzle: slightly easier than a normal Stumper, but still a tough puzzle. I finished where the cursor is in the image. Upon reflection, nothing in that area is really tough, other than 7D which I didn’t know immediately. 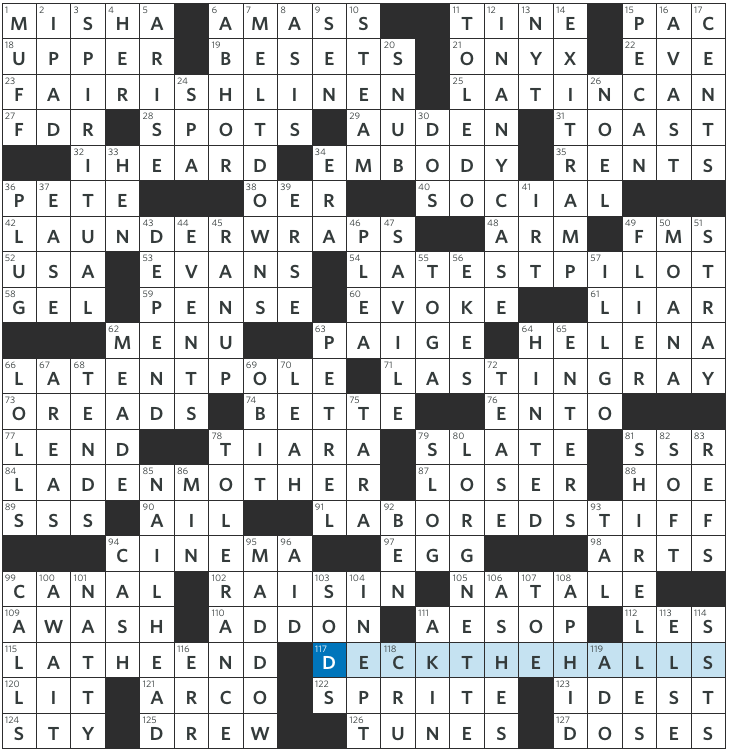 72 words in this one, which usually means a themeless with great fill, and this puzzle is no exception. A nice breather before what will surely be a killer Stumper next week. 4.4 stars. 20A [One extremely well-fixed] GAZILLIONAIRE – This is actually in the dictionary, believe it or not. Bruno Mars helped out on a song called “Billionaire,” but it is all amounts of money I will never have! 51A [Interrogative endorsement] WHAT’S NOT TO LIKE? – Awesome entry. And an apt description of this puzzle! 57A [Canada’s Freshmart chain] GROCERY STORES – This is tough. Unless you live in Canada! 64A [Under canvas] TENTED – I put TARPED in here at first. This caused some minor problems! 30D [Luther Burbank’s California home] SANTA ROSA – Why don’t I know who this is? Evidently Burbank, CA, is named for him, as well as many other things, according to his Wikipedia page. 42D [With 65 Across, Xbox part] DISC TRAY – I don’t have a gaming system, as I am terrible at them, but I might purchase one. Maybe I should just practice! 52D [NBC show in its 67th year] TODAY – If I watch any of these morning shows, it is this one. Not sure why. I’d rather watch Sportscenter over any of them! 56D [The E in the NYSE’s EL] ESTEE – This must be the stock symbol for Estee Lauder cosmetics. Pretty sneaky clue, Stan! This entry was posted in Daily Puzzles and tagged C.C. Burnikel, Dan Fisher, Joon Pahk, Lester Ruff, Mike Shenk. Bookmark the permalink. Yes, you can SUBORN (bribe someone) to commit something other than perjury. I can’t quote the exact chapter and verse, but in Macbeth when the poor underlings get blamed and killed for murdering Duncan, someone says “they were suborned.” I’m sorry, I don’t want to go look it up right now. It’s all I remember. As for PEIRCE, I referred to him in a graduate school paper and misspelled his name. Today I waited to get some crossings because I still didn’t remember how to spell it. 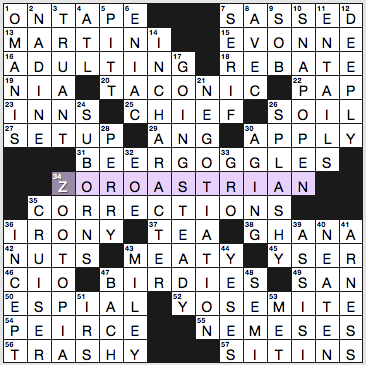 Marvelous crossword, thank you. Too easy, I know. Yes, you can SUBORN any crime, although the term is most closely associated with perjury, and one would tend to think of other crimes in terms of soliciting or conspiring, or even aiding and abetting. One British statute lists aiding, abetting counselling, procuring, and suborning the commission of an offense as essentially synonymous. Those adjectives/nouns appear in the definition of one aspect of the elements of the crime of attempt, although there are slight differences between them. It reminds me of my favorite question on the multistate bar exam some years ago. A husband gifts his wife a mink coat for her birthday, but doesn’t tell his wife and leaves the coat in the closet by the door. There is a birthday party for the wife and when the party is over, the wife and her girl friend are cleaning up when they discover the coat. They assume it belongs to one of the guests and decide to steal the coat. Are they guilty of a crime? Possibilities are theft, conspiracy and attempt or one or more of these. seems to a non-lawyer type that at this point in the story, there has been no theft or even an attempt at theft. only the conspiracy to commit a theft in the future. is that right? No crime. Factual impossibility. There can be no theft on these facts. Guilty intent is not enough without a culpable act. Now … if they are stealing it for the girlfriend, my answer might be different, but, heck, it’s Christmas. There is not a list of the right answers on the bar exam. I think it can’t be theft or conspiracy because you are not actually taking something and conspiracy is colluding to commit a crime. I guessed that it was attempt because if the situation is such that you believed it was a crime and if what you believed had been true it would have been a crime, you can be charged with attempt. disallowed in child prostitution cases where a policeman poses as underage and is solicited by an adult. Still can’t figure out the 35-A clue, can someone help me out? a “slip” is a mistake. one way to respond to or “cover” for making a mistake is to correct it. a bit of a stretch, perhaps, but not overly so. If you’re talking about the NYT, I read that as a slip being a kind of error, as in “slip-up”; for which a correction would be a cover. Gotcha, thanks Norm and dh! Just noticed that myself and was coming here to ask much the same question. Loved both puzzles and found the corners in both relatively straightforward and the center section pleasantly difficult. And the much requested, whoever is performing, Free Bird!! NYT: PEIRCE could alternatively been clued to refer to Big Nate comic strip and graphic novel author Lincoln Peirce (pronounced “purse”). His work is hilarious and enjoyed by upper elementary and middle-schoolers, teachers, and anyone who appreciates the remarkable insights of a clueless but essentially nice sixth-grader. I found the puzzle fairly challenging and enjoyable. Good Saturday. The WSJ was fun, too. I thought the theme answers were built on expressions that are entirely in the language and were not overly contrived. This seems to be a Mike Shenk characteristic and I always enjoy his puzzles under his nom-du-jour. 4D in the Stumper: Eliza is saying “Will you pay me for them?” I wouldn’t say her English is bad, just your typical East End of London accent. And Shaw’s renditions aren’t always to be trusted, him being an Irish boyo an’ all, except he spoke posh, from what I have seen on old clips. Derek, re LAT: Hot dogs and potato salad were ubiquitous and inseparable at summer family reunions and Labor Day picnics in the days of my Midwestern youth. Even so, my first thought was potato chips, which are probably much more common today. “Bubble” tea, as it is more commonly known in English, is pretty common on the west coast, in Asian restaurants, malls, and at street stands. No Stumper’s a pushover, but this one came close for me. LAT: I thought the fire was called the Camp Fire, so that slowed me down a bit. I thought this puzzle was full of lively expressions. Nice! Camp Fire was November; Carr Fire was July/August. I’m guessing this puzzle was written before the Camp Fire [which would have been less confusing had they called it the Camp Creek Fire]. I’m with Amy on cluing PAP. [ ___ test: (cervical screening procedure)], e.g. I can’t imagine anyone looking askance at that approach. By the way, this test was named after a Greek-American scientist named George N. Papanicolaou. WSJ: 28a [Jaguar features] SPOTS. I would have preferred to see—among felines—something else in the clue, such as leopard or cheetah or ocelot. Jaguars’ coats are characterized by the more open rosettes. Of course there are often spots in the centers of those rosettes, as well as on the head, legs, and tail. It just strikes me as either slightly ignorant or slightly perverse to choose jaguar.